Put the egg yolks in a medium bowl and set the bowl over a saucepan of simmering water. Add 1/4 cup plus 2 tablespoons of the sugar and whisk over low heat until pale yellow and thick, about 5 minutes. Whisk in the milk, bourbon, rum and brandy and transfer to a large bowl. In another large bowl, whisk the egg whites with the remaining 1/4 cup plus 2 tablespoons of sugar until very soft peaks form. Stir the whites into the yolk mixture. In a medium bowl, beat the heavy cream until lightly thickened. Fold the whipped cream and nutmeg into the eggnog and chill thoroughly. Whisk to reblend before serving. 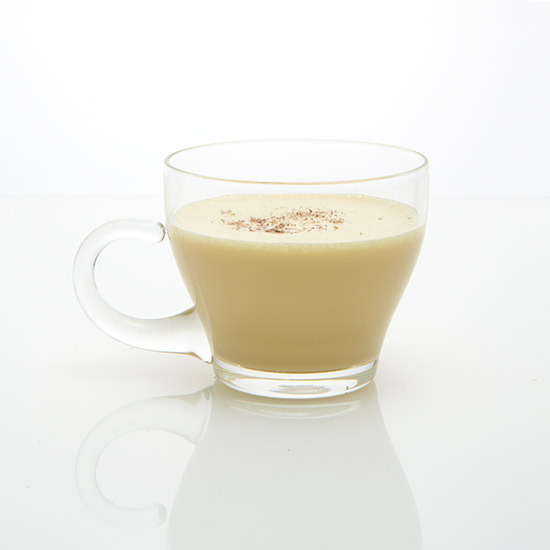 The eggnog can be refrigerated overnight. Stir before serving.